Ardwick is a district of Manchester in North West England, one mile south east of the city centre. The population of the Ardwick Ward at the 2011 census was 19,250. Historically in Lancashire, by the mid-19th century Ardwick had grown from being a village into a pleasant and wealthy suburb of Manchester, but by the end of that century it had become heavily industrialised. When its industries later fell into decline then so did Ardwick itself, becoming one of the city's most deprived areas. Substantial development has taken place more recently in Ardwick and other areas of Manchester to reverse the decline, notably the construction of many facilities for the 2002 Commonwealth Games held nearby in Eastlands. In the late 19th century Ardwick had many places of entertainment, but the only remnant of that history today is the Art Deco-style Manchester Apollo, a venue for pop and rock music concerts. Prior to the Industrial Revolution, Ardwick was a small village just outside Manchester in open countryside. The principal residents were the Birch family, one of whom was a major general when Oliver Cromwell (briefly) instituted direct military rule. One Samuel Birch was instrumental in providing a small chapel of ease, dedicated to St. Thomas, and consecrated in 1741. This soon expanded into a Georgian church, to which a brick campanile tower was added in the 1830s. It contained a very rare Samuel Green organ, the first in which the sharp keys were distinguished in black. There was also a memorial chapel to the dead of the First World War, chiefly men of the local territorial unit. These have been removed, and the church is now used as offices for voluntary organisations. Grand terraces of regency houses (some of which still survive) were built either side of the church, and these were fronted by Ardwick Green, a private park for the residents, containing a pond. Similar housing developments to those around the Green took place along Higher Ardwick and the area known as the Polygon. Early inhabitants included members the family of Sir Robert Peel. Charles Dickens drew many of his characters from life, and was a frequent visitor to Manchester. It is said that Dickens based the character of the crippled Tiny Tim in A Christmas Carol on the invalid son of a friend who owned a cotton mill in Ardwick. During the 19th century, Ardwick became heavily industrialised and it was characterised by factories, railways and rows of back-to-back terraced houses being juxtaposed. Large numbers of Irish immigrants settled here, as they did throughout Manchester. Ardwick railway station is at a junction where the Manchester and Birmingham Railway, later the London and North Western Railway diverged from the line to Sheffield that became the Great Central Railway. Nicholls Hospital, a neo-gothic building that was later a school, was constructed on Hyde Road in the last quarter of the 19th century. More recently it has become the Nicholls Campus of the Manchester College. The railway bridge across Hyde Road was known by older residents as the "Fenian Arch". On 18 September 1867 it was the scene of an attack upon a prison van carrying two Fenian prisoners to the former Belle Vue gaol (jail). One police officer was shot dead. Three Irishmen involved in the affray were caught, tried and executed. The men are referred to by their supporters as the "Manchester Martyrs". Ardwick electoral ward within Manchester City Council. Ardwick ward is represented by three councillors, Mavis Smitheman, Bernard Priest, and Tina Hewitson, all members of the Labour Party. Smitheman (2008–09) has served as Lord Mayor of Manchester. indicates seat up for re-election. indicates seat won in by-election. Ardwick railway station is located on the Hope Valley line and has two trains in each direction every weekday to Manchester Piccadilly. Ardwick Green Park has recently been refurbished, and though the pond is no more, it still contains an interesting glacial erratic in the form of a boulder. There is also a cenotaph commemorating the Eighth Ardwicks, once a Territorial Army unit of the Manchester Regiment. Ardwick Green Barracks is a fine Victorian castellated structure bearing the old volunteer motto "Defence Not Defiance". It is still in military use today. The Manchester Apollo, a 1930s Art Deco theatre, is one of Ardwick's most famous landmarks: it was in use as a cinema from 1943 and was renamed the ABC Ardwick in 1962. An independent operator took over in 1977 and staged pop concerts interspersed with the occasional film, until dropping films entirely. The venue now plays host to national and international performing artists. Extensive demolition of dilapidated Victorian terraces took place around Ardwick during the 1960s. Some residents remained in the area in new council-owned houses and flats, while others were moved to overspill estates such as Hattersley. Stephen Bradbury. Artist and illustrator. Born and brought up as a boy in Ardwick. Heywood House, Bennet Street. Edward Evans, the last of the five Moors Murders victims, was from Ardwick. He was 17 years old when murdered in October 1965 by Ian Brady in Hattersley. J. Milton Hayes, actor and poet, best known for his 1911 dramatic monologue "The Green Eye of the Little Yellow God"
Ellen Wilkinson, MP, the Ellen Wilkinson High School, was named after her. ^ "City of Manchester Ward 2011". Retrieved 4 January 2016. ^ Lewis, Samuel (1848). "Appleford – Ardwick". A Topographical Dictionary of England. British History Online. pp. 66–69. Archived from the original on 6 June 2007. Retrieved 4 May 2007. ^ a b "Ardwick". 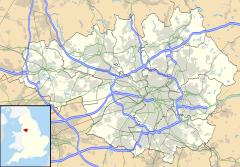 Districts & Suburbs of Manchester. Manchester 2002. 2002. Retrieved 4 May 2007. ^ Peacock, Doug. "Charles Dickens – writing from life". Cotton Times. Archived from the original on 20 July 2007. Retrieved 5 May 2007. ^ O'Rourke, Adrian. "Nicholls Hospital". Retrieved 27 September 2010. ^ Nicholls (2004), p. 58. ^ "Mavis Smitheman". manchester.gov.uk. Manchester City Council. Retrieved 16 May 2018. ^ "Bernard Priest". manchester.gov.uk. Manchester City Council. Retrieved 16 May 2018. ^ "Tina Hewitson". manchester.gov.uk. Manchester City Council. Retrieved 16 May 2018. ^ "The Lord Mayor's Office: Former Lord Mayors of Manchester (1892-Present)". manchester.gov.uk. Manchester City Council. Retrieved 24 March 2017. ^ Staff writer (5 October 2012). "Tributes after former Lord Mayor Tom O'Callaghan dies". Manchester Evening News. Trinity Mirror. Retrieved 30 April 2017. ^ "Ardwick ward local by-election - Thursday 15 November 2012". manchester.gov.uk. Manchester City Council. 15 November 2012. Retrieved 30 April 2017. ^ "Geograph:: Glacial erratic at Ardwick Green". geograph.org.uk. ^ "Territorial Army Barracks - Ardwick Green". manchesterhistory.net. ^ "O2 Apollo Manchester in Manchester, GB". Cinema Treasures. ^ "O2 Apollo Manchester". o2apollomanchester.co.uk. ^ "Court cleared for Moors murder charges hearing". The Guardian. London: Guardian News and Media. 7 December 1965. ^ Branaghan, Sim (November 2011). "Biography: Tom Chantrell and the World of British Film Posters". Tom Chantrell Posters. Archived from the original on 28 July 2017. Retrieved 28 July 2017. ^ "Former home of Victorian writer Elizabeth Gaskell restored to how it was in the days she entertained Charles Dickens and the Bronte sisters". Daily Mail. London: DMG Media. 4 October 2014. ^ Walters, Sarah (22 March 2013). "Johnny Marr's coming home". Manchester Evening News. ^ Ottewell, David (1 March 2010). "Coronation Street star Bill Tarney calls for NHS support". M.E.N. Media. Nicholls, Robert (2004). Curiosities of Greater Manchester. Stroud: Sutton. ISBN 0-7509-3661-4. This page was last edited on 15 November 2018, at 13:45 (UTC).